Andre Greipel stormed to his third stage win of the 2016 Giro d'Italia on a day of dominance for his Lotto-Soudal team. 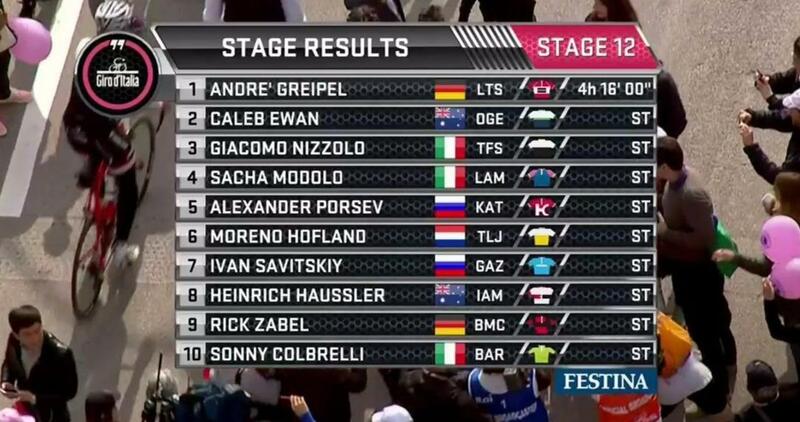 Greipel sprinted for victory after riding the flat 182 kilometres of stage 12 from Noale to Bibione, outsmarting Caleb Ewan in the final few yards to rack up his 20th Grand Tour stage win - tying Erik Zabel's German record. The peloton was split by a crash two kilometres from the line, ensuring Bob Jungels remains in the pink jersey as the race heads for the hills and a string of mountain stages. Upcoming steep tests will likely see Greipel drop out of the tour, but he bowed out in fine fashion. Pink-jersey hopeful Vincenzo Nibali lost one of his Astana lieutenants in the shape of Valerio Agnoli, who succumbed to injuries sustained on Wednesday, and the rain-sodden conditions will have done little to lift the spirits of many on a fairly sedate route. Daniel Oss and Mirco Maestri broke off early, while Giacomo Nizzolo also grabbed points in the fight for the red jersey, which Greipel is likely to concede in the coming days. As Lotto-Soudal reeled in the breakaway, they led for the final 20km as Greipel was positioned perfectly for the twisting sprint, two laps of a road circuit featuring 16 right-angle corners. The tight nature of the course meant Lotto were able to cover off any potential challengers, though Ewan did his best to push Greipel in the final sprint. However, the crafty German closed off the Orica–GreenEDGE man, who ran out of room to pass Greipel at the barriers, sending the sprint king to victory.